Meryl Davis and Charlie White perform their Short Dance at the 2013 US National Figure Skating Championships. Competition resumed this afternoon in Omaha at the 2013 U.S. National Figure Skating Championships with the ice dance competition. Fifteen teams competed the short dance—a Yankee Polka pattern dance intertwined with a waltz or march rhythm. As expected, 2011 World Champions Meryl Davis and Charlie White are at the top of the leader board, scoring 79.02 points with their Giselle-themed program. Davis, 26, and White, 25, were nearly perfect in their program—earning the all-important level four for each of their scored elements, and received average scores of 9.68 to 9.96 on their program components. Should they capture the title tomorrow, Davis and White will become the sixth team in history to win five U.S. ice dance titles. Finishing in second place was Madison Chock and Evan Bates, who were fifth in this event last a year ago—their debut at this competition as a team. Chock, 20, and Bates, 23, skated to Cirque de Soleil’s Quidam in their routine, and like the leaders, earned level four on each of their elements. They earned a personal best 70.80 points in the competition. Maia Shibutani, 18, and Alex Shibutani, 21, second in this event the last two seasons, are in a surprising third place. The siblings have struggled of late—finishing in eighth place at the 2012 World Championships after medaling in their debut in 2011, and failed to qualify for the Grand Prix Final after an uneven fall season. Skating to music by Incantation, a London-based tribal/South American music band, the duo received a level three for their circular steps, and received a one-point deduction for an extended lift. Madison Hubbell and Zachary Donohue finished in fourth place with 67.75 points, and are searching for their second consecutive podium finish in the event. The duo received level four on all but one element—their midline no touch step sequence, for which they received a level three. Last year’s pewter medalists, Lynn Kriengkrairut, 24, and Logan Giulietti-Schmitt, 27, finished in fifth place with 64.69 points. 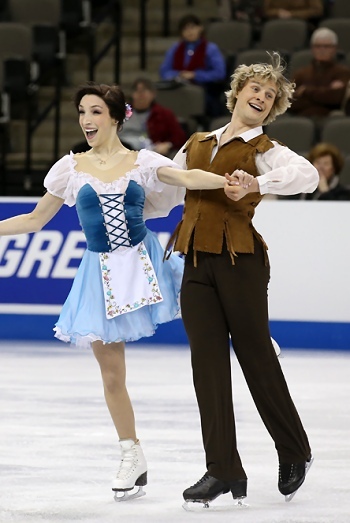 Anastasia Cannuscio, 20, and Colin McManus, 22, finished in sixth with 56.33 points.